This collection of original articles—8 years in the making—shines a bright light on recent advances in financial econometrics. From a survey of mathematical and statistical tools for understanding nonlinear Markov processes to an exploration of the time-series evolution of the risk-return tradeoff for stock market investment, noted scholars Yacine Aït-Sahalia and Lars Peter Hansen benchmark the current state of knowledge while contributors build a framework for its growth. Whether in the presence of statistical uncertainty or the proven advantages and limitations of value at risk models, readers will discover that they can set few constraints on the value of this long-awaited volume. University, research, and major public libraries with finance and economics holdings, academics in finance and economics, finance and economic professionals. 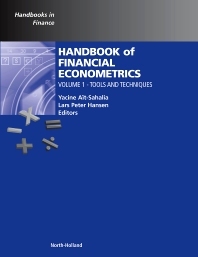 "With contributions from many (if not most) of the world’s leading scholars in financial econometrics, this volume summarizes the key advances in this field over the past two decades. " "This is an outstanding collection of papers covering major recent developments in financial econometrics. Not only is this Handbook a valuable reference, the comprehensive and accessible chapters will make excellent readings for Ph.D. Courses on Empirical Finance and Financial Econometrics." Lars Peter Hansen is David Rockefeller Distinguished Service Professor at the University of Chicago, and is an internationally known leader in economic dynamics. Hansen guides the scholarly direction of the Becker Friedman Institute and chairs the Institute Research Council. He was one of the forces behind the 2008 creation of the Milton Friedman Institute, the predecessor of the Becker Friedman Institute, and served as its founding director. He was one of three in 2013 to be awarded The Sveriges Riksbank Prize in Economic Sciences in Memory of Alfred Nobel along with Eugene F. Fama and Robert J. Shiller "for their empirical analysis of asset prices." Hansen’s work explores formal implications of dynamic economic models in which decision makers face uncertain environments. The main theme of his research has been to devise and apply econometric methods that are consistent with the probabilistic framework of the economic models under investigation. His work has implications for consumption, savings investment, and asset pricing. Hansen's early research in econometrics was aimed at developing time series statistical methods to investigate one part of an economic model without having to fully specify and estimate all of the model ingredients. The applications he explored with several coauthors included systems that are rich enough to support models of asset valuation and to identify and clarify empirical puzzles, where real-world financial and economic data were at odds with prevailing academic models. He continues to explore, analyze, and interpret implications of dynamic economic models in environments with uncertainty from a time-series perspective. His recent research explores ways to quantify intertemporal risk-return tradeoffs and ways to model economic behavior when decision makers are uncertain about how to forecast future economic events. Hansen won the 2010 BBVA Foundation Frontiers of Knowledge Award in the Economics, Finance and Management “for making fundamental contributions to our understanding of how economic actors cope with risky and changing environments.” He also received the CME Group-MSRI Prize in Innovative Quantitative Applications in 2008 and the Erwin Plein Nemmers Prize in Economics from Northwestern University in 2006. Hansen is a fellow of the National Academy of Sciences and the American Finance Association. He also is a member of the American Academy of Arts and Sciences and past president of the Econometric Society. Hansen is the editor of two Elsevier publications – Handbook of Financial Econometrics, Volume 1, Tools; and Handbook of Financial Econometrics, Volume 2, Applications.